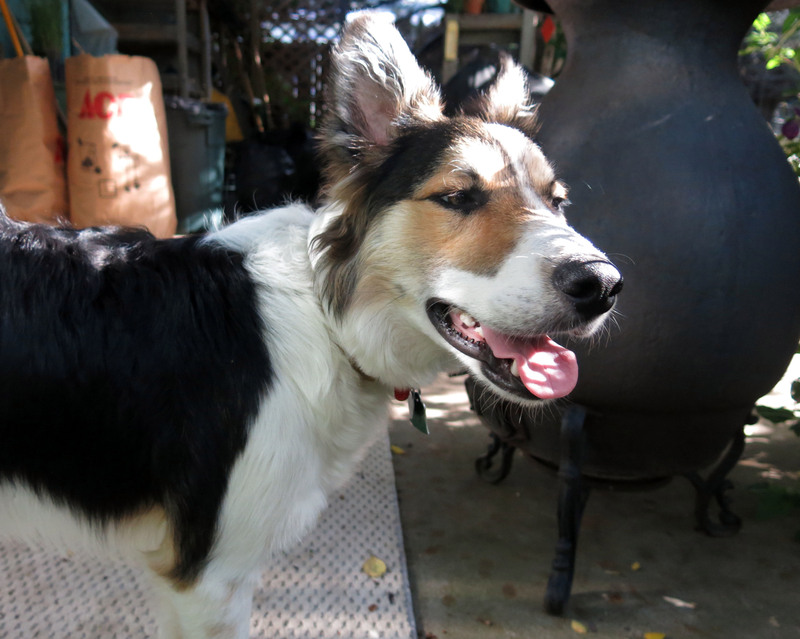 Greetings and salutations, everyone; yes, once again it is I, Mani the fairly small purebred border collie, a.k.a. 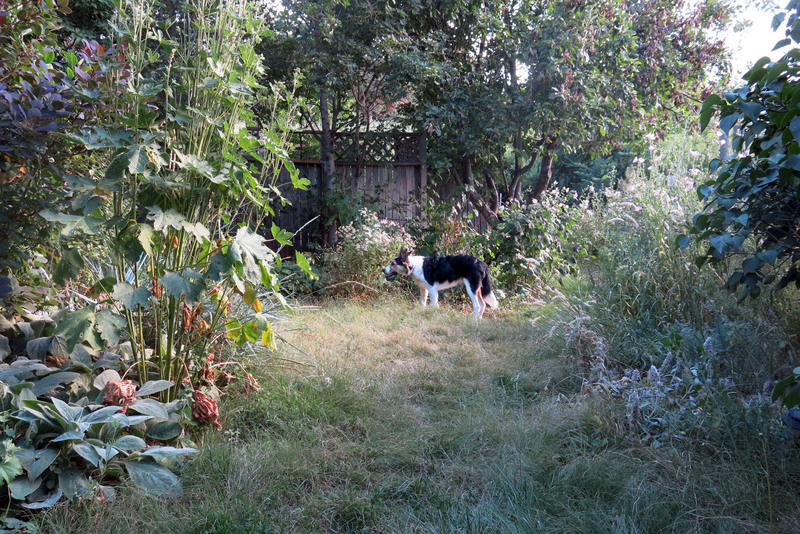 The Noodle (as in “naughty noodle”), filling in for the guy I live with, and here to bring you the latest news from our garden, and a snippet of news about me. You may remember me from such posts as “Cone Free” among at least a few others. Here I am in a characteristically sun-drenched pose. Here I am a little later, not so much in the sun. The day went pretty well, considering how it started. The guy I live with was making my breakfast, with the bowl on the counter, and I stood up to see how things were going, and accidentally knocked the bowl, and my breakfast, onto the floor. I suppose it would have been a lot more funny if it hadn’t been my breakfast, which as you may realize is extremely important, but I was able to take care of it, “much to the relief of everyone concerned”. There’s been a grass sitting on the patio for a while now. It’s a ‘Mega Blue’ big bluestem, and the guy I live with says the autumn color on it is spectacular; purple, red, orange, yellow, and so forth. I can see the blue so I don’t know why anyone would want that to change. It doesn’t look so blue in this picture, though. After my morning walk, and my lunch, which passed uneventfully (but it was good), it rained. And then it stopped, and the sun sort of came out. This picture was taken from the table on the patio. The guy I live with said it didn’t rain enough for the little meadow to get much of a drink. That’s the meadow there on the left, with bluebunch wheatgrass in flower. You can see how quickly it dries out after a rain, these days. 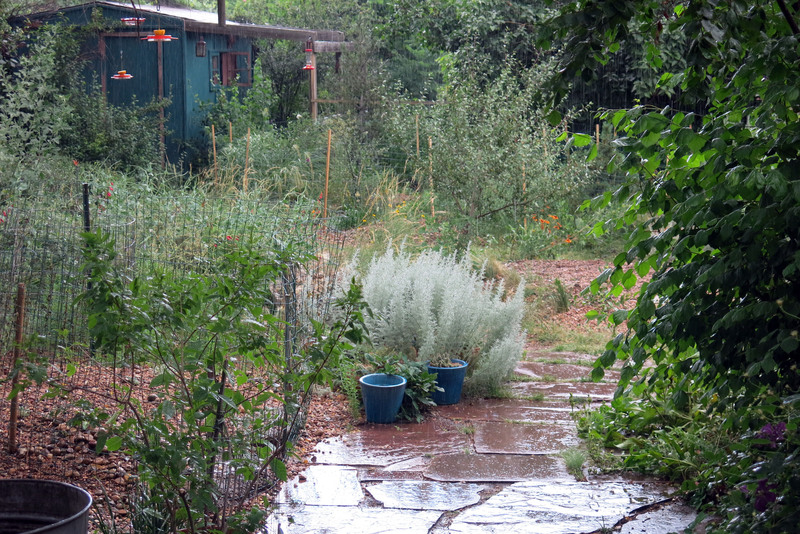 In the lower right there were a bunch of native grasses this spring, but I ate most of them. Some of the tansies in the “way back” looked all dead and stuff, so the guy I live with cut them down with a sickle. I think it looks much better. You can also see the mowing that the lawn needs badly. That’s pretty much all I have for today. 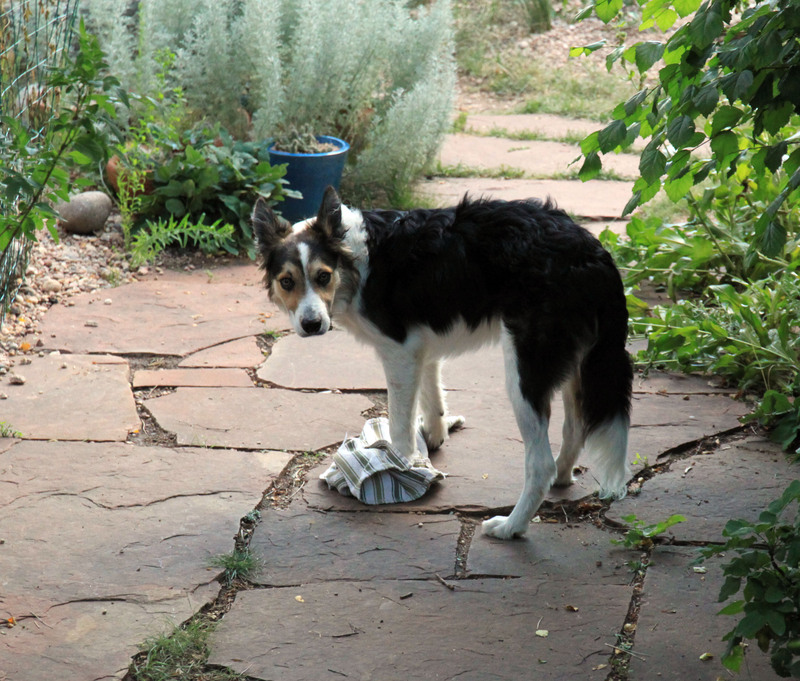 I stole a dish cloth, which I’m not supposed to do, but it’s really fun to, so I did. I do look fairly guilty, don’t I? I’ll let you go with that. It *poured* here at work twice yesterday. Thunder and everything! We could hear the thunder from our house. When will summer be here? tomorrow and Friday, they say. Today wasn’t too bad, though. Pretty nice today. Though I have tummy troubles and couldn’t go to Day Care. I have meds and prescription food. it’s always such fun reading about your day, mani, and the antics of the guy you live with. from today’s photos i can see that you’re getting really big, and handsome! that blue grass is beautiful ~ hope you will post a photo of it in autumn. 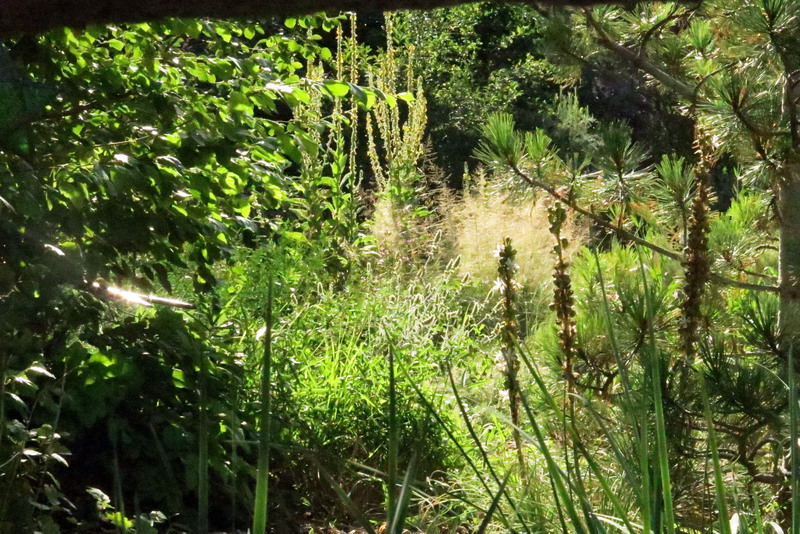 i have several grasses growing here and each has a different flower, usually showing later in the summer and early fall. Thanks; hopefully the grass will live, and look really good. Thanks; I came with that eyeliner. The guy I live with said the dish towel, which has seen better days, did not belong outside. 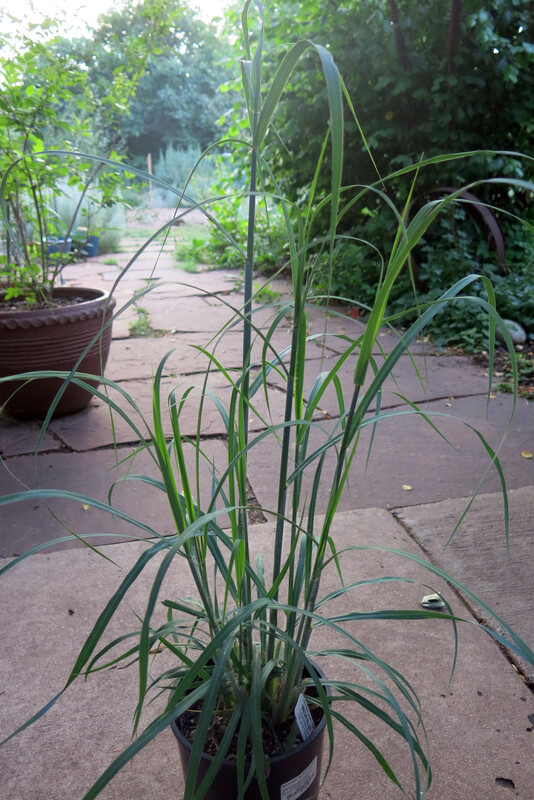 Grasses are indeed excellent. I forget which species are my favorite. The first photo is your fashion shot, Mani, as your coat and the pots’ color blend so well. The last shot, your expression reads to me as “And what is wrong *now*?” The dishcloth in question appears fairly upscale but perhaps that is solely in comparison to my own raggedy, stained bits of cloth. We all know by now – surely you’ve noticed? – the push by the guy you live with to Clean All The Things. 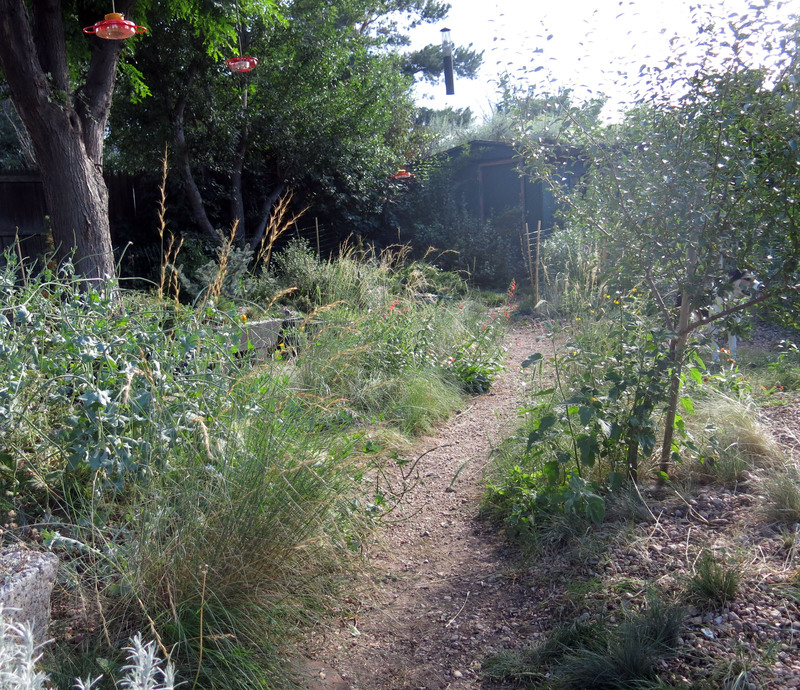 The blue grass will look lovely in the garden — both grass and garden look right for each other. Such a lineup of bird feeders! To not leave them full would me a mean jest to the birdies, so I’m sure your guy makes an equal push to Fill All The Things too. 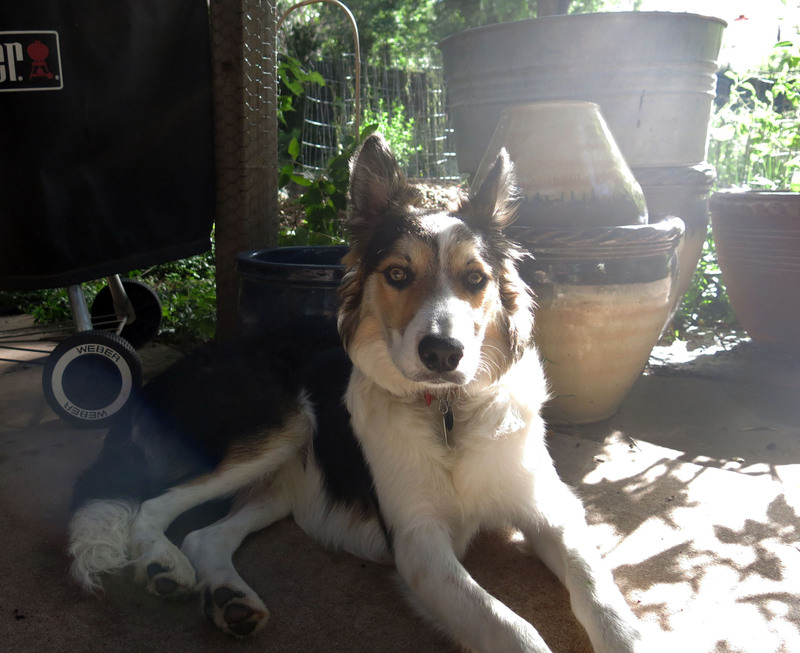 Well, the guy I live with thought that my tummy troubles might have come from eating everything in sight, but no, I have clostridium again, just like the purebred border collie who live here before me did, all the time. There are two oriole feeders and two hummingbird feeders. Yes, that’s an upscale dish cloth. “Upscale”, if you didn’t know, means “excellent chewing material for purebred border collie puppies”. Thanks. Yes, clostridium is common. Chess got it all the time. Sigh. Have you tried probiotics after the course of antibiotics? Don’t know but maybe it would help prevent reinfection and strengthen the gut a little. Or maybe just a little plain yogurt would help and be tasty too. The guy I live with forgot the yogurt today, but I am definitely on the mend. I like grass, and bunny poop is like processed grass, and it’s good. That’s why I get clostridium. Or one reason anyway.